I used Hero Arts Sweet on You digikit, paper by My Mind's Eye, a journaling card from THIS sweet set (on sale today!!! ), my own sentiment, yummy twine from The Ribbon Girl and LOTS of Glossy Accents. Soooooooooooooo very sweet Lucy! I think you should send this card to yourself *wink*! Hope your first week back at school went OK...I'm getting a sore throat just in time for my return to work - typical! Gorgeous, Lucy love this cute card and the glossy accents, beautiful work. Wonderful! A true "Lucy" card! Love the shine on the cherries... so fun. This card is "so sweet" Lucy, I ADORE it! I am just in love with your work, lucy! you're an inspiration! 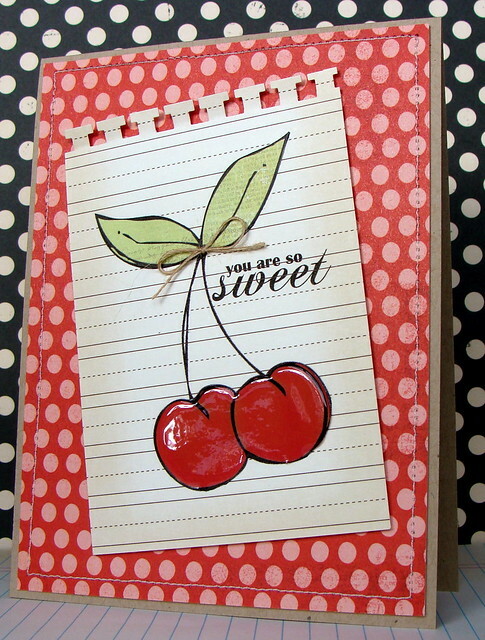 Polka Dots and Cherries made a very pretty card. Love how cheerful it is. Love how bright and colorful this is! Yummy colors! I LOVE this card. Everything about it is gorgeous! So charming! Love the bold polka dot paper in the background!!! So darn cute! Love this one! Love this Lucy! The cherries are soo yummy! LOVE those glossy cherries! So fun! Cute card! I love the glossy cherries.